I knew Gene Bernofsky because he was one of my teachers at Upland School, which I attended for grades 4 and 5. This teaching trio, comprising Gene and Suzanne Marsden, my new stepmother, and Lisa Johnson, made a valiant effort to keep up with my appetites for reading, writing, geography, and math. I remember Gene as enthusiastic, energetic, and a little unpredictable but in a good way -- you knew he was looking out for everyone. I remember his wife JoAnn as a centered, owl-eyed companion, a smooth and steady rudder to complement and direct Gene's churning energies. At Upland, I don't remember whether I knew Gene and JoAnn had also lived on a commune -- or maybe that made me feel a bond with them. I cringe to think it's pretty likely I asked him if he smoked pot. Gene told us stories about growing up in New York, about his Jewish heritage, and about being named after labor leader Eugene Victor Debs. We then had a wonderful Gene-by-proxy experience when I went with my father, stepmother, sister, and brother to New York in about 1977 on an epic road trip from Colorado to the East Coast (22 states altogether! Plus Montreal!). Gene offered his Aunt Mary and her apartment in Brooklyn as a base for us during our stay in New York City. "Call her Aunt Mary," Gene assured us, which we debated about whether we should do but which actually did seem to delight her during the three days she so kindly hosted all of us. The worst part of that trip: I was on crutches by the time we got to NYC -- I had just broken my leg a couple of days earlier in Pennsylvania. The best part: We rented a wheelchair and people were incredibly nice to us, on subways and streets all over Manhattan and the boroughs. A man saw me in my wheelchair and foot and ankle in a big cast with my rain-soaked family huddling near the Gotham Hotel, dashed back into the hotel, and emerged moments later with a collapsible umbrella he insisted we keep as he jumped into a cab and sped away. Like Gene, Aunt Mary was sweet and smart and interesting to talk with. And Aunt Mary worked for Bantam Books, a Penguin Random House imprint, so she had shelves and stacks of popular paperbacks all over her cheerful garden-level apartment. As we were leaving, she let me pick out a stack of books to take with me. I chose about 10 books. Some was fiction I enjoyed very much while my leg started healing over the next few weeks and umpteen states, including a suspense novel about a top tennis player who becomes the target for a sniper at Wimbledon. It's very modern for its moment: to throw off the sniper, the heroes do some trickery that depends on stretching out the gap between what is broadcast "Live" on TV and what is happening in real-time. And a dictionary plays a major part in the action -- what's not to love? But for some reason I remember equally vividly devouring the books Passages, by Gail Sheehy; Your Erroneous Zones, by Wayne Dyer; and a book about what your favorite and least-favorite colors say about your personality. Since last night I have learned that Gene and JoAnn Bernofsky (Eugene Victor Debs Bernofsky, the namesake of the labor leader Eugene V. Debs) now live in Montana. He worked for the post office for a while and has been making films since before his Drop City days, but in more recent times has pedaled hundreds of miles around the region on his bicycle to record environmental abuses on camera. 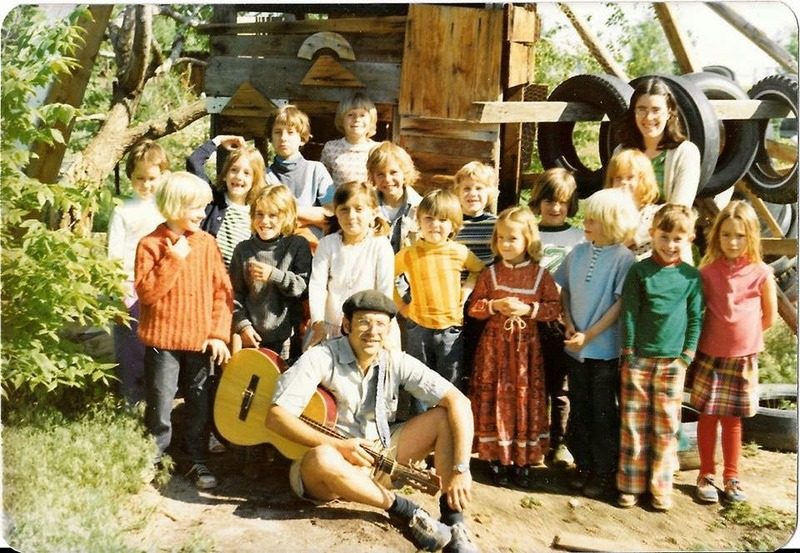 I love discovering these things about Gene, a teacher to whom I have always been most grateful for sharing with me and the other kids Pete Seeger songs and Woody Guthrie songs, and playing us Ella Jenkins and other Folkways records we sang and plunked and clanged along with. What rich veins of musical and social history he shared with us youngsters. I wonder what the other kids remember. Gene's story reminds me that absolutely anything is possible in a lifetime. We are always getting fresh opportunities to do what matters most to us. To paraphrase Alan Watts in talk on "Intellectual Yoga," "Karma is not the law of cause and effect: 'If you do this, that will happen.' Karma simply means action. That you do whatever it is you do -- whether playing tennis, climbing mountains, or nursing sick patients -- as your dharma." Or, as I saw in one of those little photo-and-quote memes that sail around the internet, "Pray with your feet."